A typical yellow jacket worker is about 12 mm (0.5 inches) long, short and blocky, with alternating black and yellow bands on the abdomen while the queen is larger, about 19 mm (0.75 inches) long. (The different black and yellow patterns on the abdomen help separate various species.) Workers are sometimes confused with honey bees, especially when flying in and out of their nests. Yellowjackets, in contrast to honey bees, are not covered with tan-brown dense hair on their bodies and lack the flattened hairy hind legs used to carry pollen. 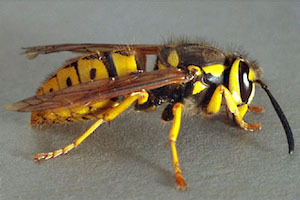 Yellowjackets have a lance-like stinger without barbs and can sting repeatedly whereas honey bees have a barbed stinger and sting only once. Some have yellow on the face. Mouthparts are well-developed for capturing and chewing insects with a tongue for sucking nectar, fruit and other juices. Nests are built in trees, shrubs or in protected places such as inside human-made structures (attics, hollow walls or flooring, in sheds, under porches and eaves of houses), or in soil cavities, mouse burrows, etc. Nests are made from wood fiber chewed into a paper-like pulp.